﻿EOM Crusades is apart of our Holy Ghost Movement. 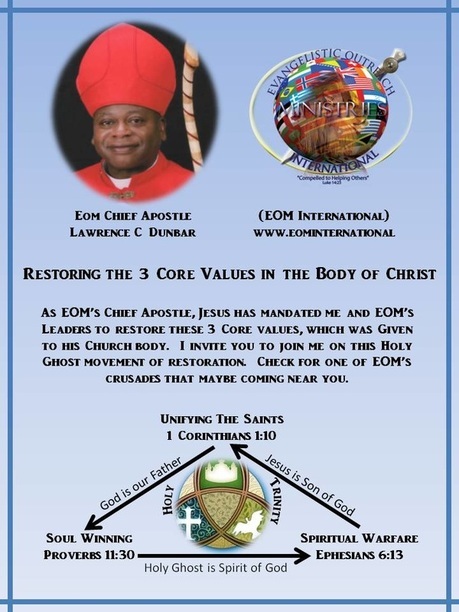 Mission: To assist in accomplishing the “Vision” that God gave to EOM Chief Apostle LC Dunbar. EOM’s vision is in according with Luke 14:23, and the lord said unto the servant, Go out into the highways and hedges, and compel them to come in, that my house may be filled. “We Are Compelled To Helping Others"
Chief Apostle LC Dunbar and the EOM Crusaders will be assisting other ministers as the Holy Ghost leads us. We operate in the fivefold ministry in according with Ephesians 4:11-13, and he gave some, apostles; and some, prophets; and some, evangelists; and some, pastors and teachers. For the perfecting of the saints, for the work of the ministry, for the edifying of the body of Christ. Below are the dates and places we will be ministering and assisting the leaders and the people of God. You are welcome to come and help us win souls in the name of Jesus Christ our Lord and Savior. For Hotel Accommodations, please click download file below. Evangelistic Outreach Ministries International, Inc.